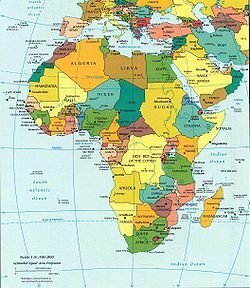 Africa is the continental landmass to the south of Europe. It is connected to Asia by the Sinai Peninsula in Egypt; the remaining borders are the Mediterranean Sea to the north, the Red Sea and Indian Ocean to the east, and the Atlantic Ocean to the west. Africa is the poorest continent in the world. "George Ayittey’s discussion of how country after country in Africa opted to throw out the capitalist baby with the colonialist bathwater on independence is a sobering example of libertarian class theory in action. He minces no words, characterizing most African countries as ruled by 'unrepentant gangsters.'" In Africa ethnic groups number in the hundreds. The dominant religion of Arabic-speaking north Africa, is Islam. It replaced Christianity in the 7th century and slowly spread west and south across the Sahara and into the equatorial zones. Today Islam includes about 41% of all Africans. The Christian churches, based on missionary work of the 19th and 20th centuries, claim 45% of the population, of whom 55% are Protestants. There are about 150 million Roman Catholics on the continent, led by 33,000 priests. The Anglican Church includes about 5 million members in Nigeria, 2.4 million in South Africa, 2.2 million in Uganda, 1.5 million in Kenya, 1.0 million in Tanzania, and 2 million or so elsewhere in Africa. For statistical detail on each church see Adherent.com, which compiles membership data from many sources. About 20-30% of the people follow traditional religions and animism. After 2000 China made its move to become the dominant trading partner of Africa, with promises of billions in investments for infrastructure. China was eagerly embraced by African governments, as trade in African raw materials and Chinese manufactured items and construction projects grew to more than $100 billion by 2008, from less than $10 million in the 1980s. African leaders spoke openly about China's offer of an alternative to the edicts of Western-dominated institutions like the International Monetary Fund and the World Bank. China's technique is to sign agreements with governments to build huge infrastructure projects in exchange for minerals. Angola, for example, guaranteed Chinese access to oil in Africa's fourth largest oil producer; Angola's economy is now booming and it is rebuilding after the massive destruction caused by a civil war that lasted decades. The worldwide recession of 2008, and continued political instability, has cooled China's activity. As commodity prices have plunged and several of China's African partners have fallen deeper into chaos, China has backed away from some of its riskiest and most aggressive plans. China now demands the same guarantees that Western companies have long sought for their investments: economic and political stability. As late as 1881 European powers had only small holdings along the coast. Then the scramble for territory began. European nations held the Berlin Conference in 1884-1885 in order to decide how to divide Africa in order to best suit their interests. No Africans were invited to the conference. Ethnic and cultural differences within Africa were ignored, and lines of demarcation were drawn to aid the European nations in their quest to subjugate the continent and its peoples. All of Africa, except for Ethiopia (which resisted Italian control in 1896) and Liberia, which would become a haven for those returning from slavery, was divided and colonized by the European nations. This colonization was an example of "white man's burden", the belief that the Africans were unable to develop civilization on their own and it was the role of Europeans to provide that. Imperialism may be argued to have had both good and bad effects. The Europeans brought advances in technology, built hospitals, and built a new, modern infrastructure, invcluding ports, railroads, telegraph, sanitation and other public works. This improved trade and communications and reduced disease. Technological advances reached different areas at different times, and much of the interior remained isolated unless it was close to a major river like the Congo or the Nile. Europeans also built elementary and secondary schools based on European curricula. Families that wanted to enter the modern sphere sent enrolled their children, and a handful went on to university in Britain and France. European national boundaries were a new concept for much of Africa which was accustomed to small tribal or village living and didn't understand how many such tribes and villages, which often warred with each other, could be put together under one national banner. This forced nationhood apart from African cultural groups and village life has continued to be a source of strife in African nations to this day. In 1900 Africa comprised many rural societies with a few towns and little infrastructure. From 1900 to 1960 Africa underwent a sustained period of unprecedented modernization, almost revolutionary in its medium and long-term effects. Urbanization created cities, as it led to mass migration and slow, if patchy, industrialization. Throughout the continent, towns expanded swiftly and new urban centers grew in the half century following the imposition of colonial rule in the 1890s and early years of the twentieth century. Towns in key locations such as Abidjan, Port Harcourt, Lusaka and Nairobi grew to be cities, typically founded as ports, harbors, administrative and mining centers, and/or as transport—especially railway—focal points. For example, in the colonial Gold Coast (Ghana) the western town of Takoradi became the colony's chief railway town. Farther down the coast, the growth of the capital city, Accra, was swift: its population increased from about 18,000 in 1901 to 135,000 in 1951. Urbanization and the development of transport infrastructures were accompanied by rapid population growth. Due in part to improvements in health care and to the progressive conquest by medical science of illnesses such as bubonic plague, yellow fever and yaws, Africa's population grew by almost 40% between 1900 and 1960. Migrants flooded into the urban centers, while traditional communities were disrupted and consequently changed as a result of their gradual insertion into the modern world economy and the effects of an increasingly centralized political environment. Power was in the capital cities. The result of population growth, urbanization, increased educational and employment opportunities, the introduction and development of cash crops for sale on the world market, and the virtual end of slavery was a new social order. The colonial system emphasized achievement rather than family name alone. While it would be an exaggeration to claim that a purely meritocratic system developed, but it was certainly the case that for many Africans upward social mobility was for the first time something that could be earned rather than bestowed by the circumstances of birth. The army, for example, trained and equipped by the colonial powers, was a popular route. Across Africa the urban-rural divide grew wider. By the 1930s, rural dwellers were separated from urbanites by wide differences in employment, access to health care, housing standards, and educational opportunity. After World War II, further subdivisions of class, ethnicity and occupation also became sharper, with old clan loyalties trumping meritocracy when they conflicted. Taken together these developments had the effect of stimulating many Africans, especially the educated elite, to question European rule and demand independence. The colonial powers had done little to prepare for the day, but almost overnight in the 1960s most colonies became independent nations. In the case of the French Empire, Paris kept tight controls. Britain gave the new nations a free hand, and most set up strong-man governments. In the case of the Portuguese and Belgian colonies, total chaos and civil wars resulted. Because most colonies were ethnically and linguistically heterogeneous—for example, Nigeria has some 250 ethnic groups or 'tribes', the Gold Coast/Ghana at least thirty—it was impossible to appeal to a sense of nationhood in terms of ethnicity or language as in Europe. By the 1950s, the native population of the typical Sub-Saharan colony can be analyzed in terms of major groups, from the most powerful to the least. Of course, the colonial administrators (and their associated businessmen, soldiers and missionaries) were at the top of the scale. The traditional chiefs were the old established elite. There was a very small professional class with European educations, including doctors, lawyers and teachers. Also included were middle-level employees of the colonial bureaucracy. Soldiers in the colonial armies; the highest rank was usually sergeant. Many had traveled during the world wars and had both technical training and cosmopolitan outlooks. They moved up rapidly after independence. An aspiring middle class who operated small businesses. They competed with immigrants from India and the Middle East. Large businesses were run by Europeans (or in some cases by immigrants from India or Lebanon). They had little capital and depended on selling products that fir native tastes, like local foods. They seldom dealt in international trade. A rapidly growing clerical element, usually with a high school education from missionary or state schools. Many were office clerks who worked for international firms and picked up organizational and language skills. The skilled and semiskilled workforce—a fast-growing element; many joined labor unions, especially in transportation, mining and the docks. Informal and illegal workers, who traded and smuggled and operated brothels, or ran illegal gambling operations. Out in the countryside, a large, poor body of cash-crop farmers—a group that formed often powerful farmers' associations to seek better prices for their products, especially cocoa. Many were heavily in debt to local moneylenders. At the bottom came the peasant farmers living in traditional style, growing their own food, seeing very little cash. They were generally controlled by local chiefs and had a strong loyalty to the tribe. Horn of Africa Djibouti, Eritrea, Ethiopia and Somalia. ↑ There are remnants of much older Coptic Christian settlements in Ethiopia. This page was last modified on 8 April 2019, at 23:58.